The Panametrics-NDT™ 37DL PLUS is an advanced nondestructive ultrasonic thickness gage that combines powerful measurement features with sophisticated data acquisition and output capabilities for applications involving pipes, tanks, and other metal structures subject to internal corrosion or erosion. The 37DL PLUS includes many innovative features that simplify true metal thickness measurements even when the exposed surface is coated or painted. The patented Thru-Coat technology measures and displays the thickness of the metal part and its coating using a 'single backwall echo'. The Oxide/Scale option measures and displays the thickness of the steel and the oxide/scale build-up on the inside of boiler tubes to help predict tube life. Accuracy of high temperature thickness measurements can be improved by using the Temperature Compensation feature that adjusts the material velocity for changes in material temperature. A Average/Min mode saves the average or minimum of several successive thickness measurements. Patented Thru-Coat™ technology measures and displays the thickness of the metal part and its coating using a 'single backwall echo'. Temperature Compensation feature adjusts the material velocity for changes in material temperature. Optional Oxide/Scale feature measures and displays the thickness of the steel and the oxide/scale build-up. Average/Min mode saves the average or minimum of several successive thickness measurements. A-scan display is brighter with better contrast and visibility. Uses a vast selection of dual element and single element contact, delay line, and immersion transducers. EMAT transducers for no-couplant steel thickness measurements through heavily scaled surfaces. The file-based alphanumeric datalogger can use longer file names (32 character max) and ID numbers (20 character max). 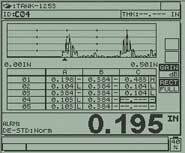 Every thickness reading in a stored B-scan can now be reviewed in the GageView Interface Program and on the gage. Select to view (Min/Max, Alarm, or A-scan flags) flags for Grid points. Grid files can be expanded by adding rows or columns or by changing the incrementing direction. The A-scan display is bright with great contrast and visibility. 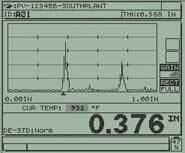 Every thickness reading in a stored B-scan can be reviewed on the 37DL PLUS and in the Interface Program. The user can select to view (Min/Max, Alarm, or A-scan flags) flags with Grid points. The file-based alphanumeric datalogger can use longer file names (32 character max) and ID numbers (20 character max). Grid files can be expanded by adding rows or columns or by changing the incrementing direction. The 37DL PLUS can be used with a vast selection of dual element and single element transducers. Its full line of D790 series dual element transducers feature Automatic Probe Recognition to provide maximum gage performance for each transducer. The 37DL PLUS also has the ability to use the E110-SB EMAT transducer for no-couplant steel thickness measurements through oxide-scaled surfaces. The M2017 and M2091 transducers are ideally suited for measuring internal oxide/scale build-up on boiler tubes. The 37DL PLUS is also compatible with the Panametrics-NDT complete line of Microscan single element direct contact, delay line, and immersion transducers ranging in frequency from 2 to 30 MHz. As a result, the gage can be used for non-corrosion applications involving materials such as plastic, fiberglass, composites, rubber, castings, rubber and glass. Application Auto-Recall automatically recalls 16 default and 10 custom Microscan transducer setups from the gage's memory. Variations in material temperature cause changes in sound velocity that may affect the accuracy of the thickness measurement. The Temperature Compensation feature allows the user to enter the calibration block temperature and also manually or automatically input the current (high) temperature at the measurement points. The 37DL PLUS will display the temperature corrected thickness that can then be saved to the internal datalogger. A-scan flag to be viewed along with each grid point. This allows the user to quickly scan through a file and locate Min/Max, Alarm, or A-scan locations. 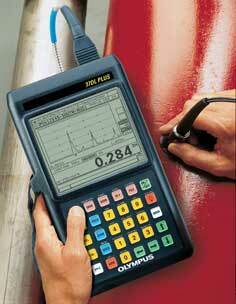 This option uses advanced algorithms to measure the thickness of oxide/scale build-up on the inside of boiler tubes. 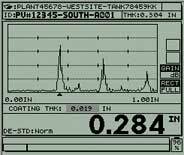 The gage simultaneously displays the metal thickness of the boiler tube and the thickness of the oxide layer. Knowing the thickness of the oxide/scale helps predict tube life. We recommend the use of the M2017 or M2091 transducer for this application. Dual Element Measurement Mode: Time interval from a precision delay after the excitation pulse to the first echo. Thru-Coat Measurement: Measurement of true metal and coating thickness using a single backwall echo (with D7906-SM and D7908 transducers). Thru-Paint Echo-to-Echo: Time interval between two successive backwall echoes for elimination of paint or coating . Mode 1: Time interval between excitation pulse to first backwall echo. 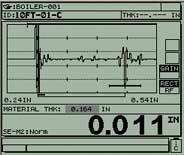 Mode 2: Time interval between delay line echo to first backwall echo with delay or immersion transducers. Mode 3: Time interval between successive backwall echoes following the first interface echo after the excitation pulse with delay line or immersion transducers. The 37DL PLUS identifies, stores, recalls, clears, and transmits thickness readings, waveform images, and gage setup information via the RS-232 serial port. Baud Rate, Word Length, Stop Bits, and Parity are adjustable from the keypad. On-gage reporting of summary with statistics, Min/Max with locations, File Comparison, and Alarm Report. On-screen comparison of current and previous readings.